Tonight is another Ransome Picks night. It is really cold on Beaty's Creek today and snow is in the forecast!! We love snow here!! It is probably because we never get very much. Ransome wants chili dogs tonight and as all of you know, what Ransome wants is what Ransome gets. Ransome will be roasting our hotdogs over the fireplace. It will be the first time Raine has seen the fireplace with a fire in it. We will see how that goes..... 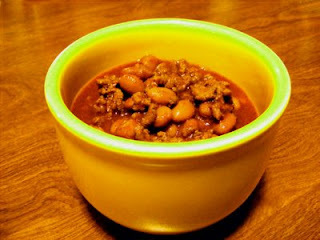 This chili will warm you up so give it a try. Brown the ground beef with onion. When beef is done and onions are soft add the following, tomato sauce, pintos, chili powder and cumin. I add water because we like our chili soupy. I cook ours all day long on a low heat. I like it better when it has cooked a while. We like it with crackers, lettuce wedges, carrot sticks and shredded cheese. Tonight it is with hotdogs. Give this easy recipe a try!